One of the big topics in the news today has been regarding the bankruptcy of Detroit. It's a pretty sad state of affairs that this once mighty city has come to, and there are some three quarters of a million people that are affected by it. On the one side, it would seem that the slide toward the inevitable has finally come to an end and they can really get on with the business of the day and move toward the future. And by future, I mean, of course, Robocop. How has this not been the headline around the world? Does nobody remember the plot for one of my favourite action movies of all time? The movie is set in a Detroit of the future that has been forced to sell itself to the Omni Consumer Products Corporation due to a financial meltdown. Mind you, this is a future in which vehicles get really terrible gas mileage, weird reality game shows with catch phrases are incredibly popular, and corporations are stronger than governments. Pretty unbelievable, yeah? But remember, it was 1987, so it was a simpler time. They didn't even know what Y2K was back then! HaHaHAHA, the fools. Sadly, while there is progress being made in artificial body parts and computer-brain interfaces we're nowhere near where we need to be to get Robocop up and running. But in the meantime, maybe this big guy can help out? Maybe this is all just a giant publicity stunt? After all, the Robocop remake comes out in 6 months. I mean, you can't buy this kind of coverage, am I right? Unless, of course, you are paying the city of Detroit to pretend to file bankruptcy so they can use that money to actually pay some of their bills. In case it turns out that this actually happened, I just want to say that I totally called it and I'm not just a crazy conspiracy theorist. Or maybe that's what they want you to think? Maybe I'm on the payroll for Columbia and MGM and the city of Detroit and the Miami Dolphins? What do you mean "What do the Miami Dolphins have to do with this?" At the back corner of the second shelf in Mr. Hanes Grade 7 Shop Class, there is a model CO2 rocket car. You might be hard pressed to identify it as such on first look, as it mostly just looks like a block of wood. But there is a hole drilled in the back where the cartridge goes. And there are two holes drilled clear through at either end of it where the axles holding the wheels will be. There are some clean lines drawn in pencil, showing the outline of what will be a sleek contour of what will prove to be a sure winner. Barring any industrious cleaning that may have happened over the last twenty-five or so years, it may still be there. Because that's where I left it. I am not a handy man. I do not use tools well. I do not have a very good relationship with physical things that could break in some spectacular manner causing no small amount of embarrassment and injury to myself and my loved ones. If I was to make something with the intent of injuring or embarrassing, it would probably malfunction and turn into a delicious though confused apple pie. Our house is not exactly littered with half finished construction projects or items sitting on a workbench in various states of repair. For starters, I don't have a workbench. And I don't do construction. In that way, I am unlike many husbands of my vintage. So when our washing machine started making a noise, I can fully understand My Lovely Wife's reaction when I said that I was going to fix it. "I can do this," I said. "The parts and the instructions are right here on this website." I was looking at a website called partselect.ca. If you have a broken appliance and don't want to hire someone to repair it, or can't afford to hire someone to repair it, it probably has the pieces you're looking for and the instructions to do it yourself. Using the website, I identified the make and model of our washing machine. The first thing that popped up was "Noise during final spin cycle". It was as though I had written it myself. That was exactly what was happening to us. Most common cause of this noise was broken shocks - which I could buy for just $50 and would fix the problem 88% of the time. There were directions and a video. "This is going to be easy," I thought. I started taking the washing machine apart that day. "Maybe we should get someone to come in and look at it," My Lovely Wife said. "I'm not going to break it," I said, which I immediately realized was probably not going to be true. "I'm not going to break it any more than it's already broken." I felt better about that. "Yes," I said, lying on the concrete floor of the basement with a flashlight. "I can see the shock absorbers that it talked about on the website." "Even if it doesn't turn out to be the shock absorbers, I will only have spent $50 on them. It's not like I'd be adding that much more to the cost if we have someone else look at it. And if it works, we'll have saved a ton of money!" I was feeling very confident with my justifications. The parts didn't arrive the next day, so I spent the time reviewing the instructions on how to quickly and easily remove the pins holding the shock absorbers in place. "Just use a hammer and tap them out," the kindly repairman said, kneeling down in front of the demonstration washing machine on a pedestal and doing just that. It was as if the pins were held in by wishes and dreams, they popped right out. If a kindly old repairman on an internet video can do this, I can do this. I eventually worked out that if I laid down on my left side with a towel over the sharp bottom edge of the access panel, I could just about move the hammer to tap out the pins. This pin had obviously been inserted with some sort of substance that to the touch appeared to be grease but was in fact superglue. In case I haven't successfully painted a word picture in your mind with the difficulty of this task, imagine trying to separate LEGO pieces inside a shoebox using only one hand. "Look at this!" I said two hours later, holding a pin up to show My Lovely Wife. "Yep, that's the pin that holds the shock on the bottom." "So there's another?" She asked. "Yes, there's one at the top." "And how many shocks are there?" "Just two," I said. "Once I get the top one out on this one, I'll get to the ones on the other side." After another hour of twisting and turning I realized that perhaps the problem I was having was that the repair guy had a pedestal and I was working on the floor. He had room to maneuver and could get leverage. I had neither, but I knew what I needed: tools. The next day found us at Canadian Tire. My problem was twofold. I needed something to hold a locking tab on the pin down and I needed something to tap the pin out. The first issue was resolved with a phone call to a friend who was going to be visiting us on the weekend. He, unlike me, is the very definition of handy and agreed to bring his tools down. But I was at Canadian Tire and I wasn't leaving without a tool. And I found it in the form of a tiny hammer. 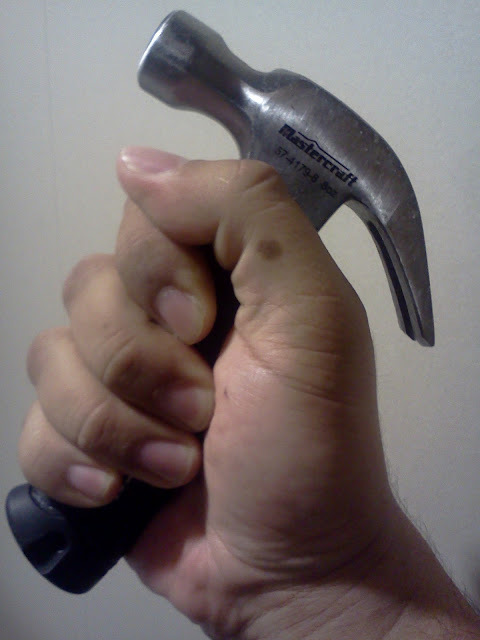 I call it Tiny Hammer (and no, I have not successfully made parody lyrics to "Tiny Dancer", but not for not trying), but it's really a regular hammer with a small handle. It's just big enough for my hand. I think it's my new favorite hammer. But I won't say that out loud around my other hammer that I've had for years or My Lovely Wife. I don't want either of them thinking that I'll trade them in for newer, more portable models. Tiny Hammer worked perfectly for the job. With that, and some ingenious use of zip ties (they're like duct tape, only better, and I feel perfectly fine saying that out loud because we don't have any duct tape but we have lots and lots of zip ties), I was able to get the shock absorber out. And just to prove how much better I was getting at it, the other one only took about three quarters of the time it took to get the first one out. Well, not really, because our washing machine was different than the stupid washing machine that the actor that was hired to portray someone who knew something about repairing washing machines. There were metal boxes that prevented the pins from coming all the way out. I re-watched the video again to see if there was a step that I missed, but of course they use computer special effects and mirrors and trick photography to make it look like it just comes right out. By this point, I'm not even sure that the guy in the video was even in the same room as a real washing machine. Our friends arrived, and I didn't force the issue that night at all because it wouldn't be polite. But the next morning found both of us arm deep in it. "How's it going down here?" My Lovely Wife asked from the basement stairs. "Good, we're almost there," I said. I almost added "don't come down", but she was already down and it probably wouldn't have had the desired affect anyway. It didn't work on my mom, I don't know why my first instinct was that it would work on My Lovely Wife. "If it's going to take a long time, we should get somebody in-"
"It's going to be fine," I snapped as visions of kindly old repair guys that turned out to be jerkbags and possibly the kind of person that would hand out fruit and dental floss at Halloween went through my head. I wasn't going to give him the satisfaction of it. "It's already broken and out of warranty," I said. "It's not like we can do any worse to it." "We're almost done here," My Handy Friend said, smoothing things out. "We've just about got it." And we did. Working together, we were able to get the shocks replaced in about two or three hours, which isn't that much longer than the video said it would take (as long as you don't take into account the five or six hours I had worked on it already). I am not going to lie - I was pretty damn pleased with myself. I mean, yes, it took a lot of help, but I had figured out how to repair my washing machine. And, looking back on it, it wasn't really that difficult or expensive to do. Yes, it took a little longer than I expected, but considering that I'd never done anything like it before, I think it balances. We hooked everything back up and balanced the machine and started it up. There are moments in my life that I have been less devastated, but I'd have to sit down and think about it before I could pick one. Maybe the first time a girl turned me down. Maybe the first time I had Christmas away from home. The day that I worked out for myself that I probably was never going to be a Cowboy/Policeman/Fireman/Scientist/Writer would be right up there. The noise was worse than ever. My Handy Friend and I picked away at it, looking for what might have gone wrong or what might have been missed. We ruled out springs, screws, metal bits caught on other metal bits. Instructions were reviewed. Some things were tapped on and other things were not tapped on on purpose. Pieces were counted and no extras showed up. "It's the bearings," My Handy Friend said. He wiggled the drum of the washing machine knowingly. "Oh?" I put my hand in the washing machine and wiggled it too. It wiggled. I was pretty sure that it always wiggled. If I recall, being able to wiggle was one of the reasons that I replaced the shock absorbers. I wiggled it some more and then it didn't wiggle in a way that it was pretty obvious it should. We did some more research on partselect.ca, who may actually not employ war criminals to star in their videos, and it turns out that if you are not in the 88%-$50-shocks-replacement bucket, you are in the 12%-$400-replace-everything-and-make-sure-you-have-a-couple-of-big-friends-to-help-you bucket. Two days later, after our friends had departed and with our washing machine sitting forlorn with bits and pieces sticking out of it (but with brand new shocks), I looked up a repair guy online and called him. "Hi," I said, as you do at the start of a call. "Hi, I have a ten year old Frigidaire front load -"
"I know what the problem is," he said. "-washing machine, and it started making a noise during the final spin cycle-" I continued. "I know what the problem is," he said again. "-and I thought it was the shock absorbers-" I said, thinking that I'd catch him with how intelligent I was. How I, a mere mortal could transcend to become as knowledgeable about washing machine repair as he was with all his years of experience. "But it wasn't that, was it." He said. Not asked, said. "-but that wasn't it." I finished. "Aha!" I thought. "Yeah, we figured it was probably the bearings." "Not worth it. Get a new one." He said. "It's about a three or four hundred dollar job. You said you had it for ten years?" "You lucked out. Those machines don't last more than three or four." "So it's really not worth it?" "You'd be throwing good money after bad." I only sat there in a dull ache for a little while, no more than half an hour probably. I wondered about where it all went wrong, and how bad things have to be when the guy that gets paid to fix things tells you to not bother fixing something. Our new washing machine is being delivered on Thursday. It's a spiffy new model, and it has features that our old one could only dream about. Not that it will make much difference because like most people we'll probably just figure out which setting is the easiest to use and just use it for everything. But it's shiny and new and it will have a warranty. And I bought the pedestal. Just in case. You work great in awkward places.